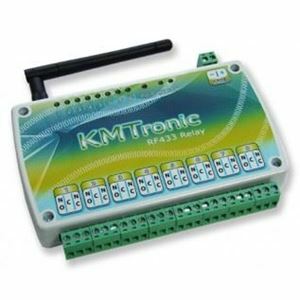 The KMTronic Radio 8 channels Relay board is a simple and inexpensive output module to control 8 relays (250VAC/10A) over Radio Freqency. Our driver allows the Control4 integration of relays as connections. High value for money CE marked relay board. 8 SPDT relays 250VAC/10A or 125VAC/15A. Support for multiple relay boards connected to the same C4 control unit. KMTronic provided the Relay board we used for the driver development and testing. Alex Edmondo participated to the requirements definition and testing. On the KMTronic (kmtronic.com) online shop, search for: KMTronic Radio 433MHz 8 channels WEB Relay board. To get a valid license code refer to houselogix market place. Enter your PIN code (in example 1234) and click Save. In “Authorization Configuration” you can change username name and password for device authentication. They will be required duringthe Driver configuration, so write them down. In the relay control interface you can test your device relays. KMTronic IP: device IP you set in the previous step. KMTronic Port: device HTTP Port if you changed it. Polling: Set it to “On” only if you plan to change the state of the relay from the native KMTronic web interface, otherwise it is not necessary. Polling seconds: select the frequency you want to update Control4 about the change coming from the KMTronic web interface. License code: copy & paste here the license code we sent to you during the license buying process. The following incoming commands from other drivers are supported: OPEN, CLOSE, TOGGLE & TRIGGER. The driver gives the possibility to use a single Control4 variable, called “CommandMask”, to control all relays. The variable is of type “string” and the message sent to the driver is composed by 8 characters. Characters must be 0 (ZERO) o 1 (ONE). The first character on the left controls the eighth relay, the second char on the left controls the seventh relay, ..., and the last char on the right controls the first relay.